SUMMARY: PICCC is the rarest, most malignant primary intracranial GCT. The purpose of this study was to describe and characterize the MR imaging findings in a series of 7 patients (6 males and 1 female; mean age, 11.9 years) with pathologically proved PICCC in our institution from 2004 to 2009. All tumors were located within the pineal (n = 6) or suprasellar (n = 1) regions. On T2-weighted MR imaging, the lesions appeared markedly heterogeneous with areas of both hypointensity and hyperintensity reflecting the histologic heterogeneity, including hemorrhage, fibrosis, cysts, or necrosis. Heterogeneous (n = 7), ringlike (n = 4), and/or intratumoral nodular (n = 3) enhancement was noted on T1-weighted images with gadolinium. These MR imaging findings, combined with patient age and serum β-HCG levels, may prove helpful in distinguishing PICCC from the more common primary brain tumors, thereby avoiding biopsy of this highly vascular tumor. Since Askanazy's first report in 1906,11 fewer than 110 cases of PICCC have been reported in the literature,3,6 and most were case reports. Only a few studies have included a description of the radiologic findings.2,3,6 The purpose of this report was to present the MR imaging features in 7 cases of PICCC. To our knowledge, our series is the largest collection of PICCC cases with MR imaging to date. From 2004 to 2009, 7 consecutive patient records with histologically proved PICCC were reviewed after receiving approval from the institutional review board at our hospital. The 7 patients included 1 female and 6 males, ranging in age from 7 to 19 years, with a mean age of 11.9 years. The diagnosis of PICCC relied on the presence of syncytiotrophoblasts without other elements of GCTs either by microscopic findings or immunochemistry. Serum β-HCG levels were measured in 6 of the 7 patients. In addition, sonographic examination or pelvic CT was performed to exclude the ovaries, uterus, or testicles as the primary site. A retrospective analysis by using medical records and MR imaging findings was performed to evaluate the clinical and MR imaging features of PICCC. MR imaging was performed in all 7 patients, and CT was performed in 3 patients. MR imaging was performed by using a 1.5T (n = 5, Magnetom VP; Siemens, Erlangen, Germany) or 3T (n = 2, Signa Excite; GE Healthcare, Milwaukee, Wisconsin) scanner. Pregadolinium T1-weighted (TR, 450–600 ms; TE, 12–16 ms) images, T2-weighted (TR, 4500–5500 ms; TE, 100–120 ms) images, and gadolinium-enhanced (0.1–0.2 mmol/kg) T1-weighted images were acquired. CT scans (3 patients) were obtained with a Somatom Plus 4 (Siemens). Noncontrast axial CT images were obtained from the vertex to the skull base by using a 3-mm section thickness, 120 kV, and 150–200 mAs. Two neuroradiologists retrospectively reviewed all the MR images and CT scans for consensus. The MR imaging characteristics were analyzed, with particular attention paid to the location, size, shape, margin, internal architecture, signal intensity, and enhancement pattern of the tumor. The presence of calcification within the lesion was determined on noncontrast CT scans in 3 patients. Most patients had nonspecific symptoms, including headache (n = 6) and vomiting (n = 6). Other presenting symptoms were blepharoptosis (n = 2), nausea (n = 1), polydipsia and hyperdiuresis (n = 1), cessation of menstruation (n = 1), and decreased vision (n = 1). The average symptom duration was 3 months and ranged from 2 days to 1 year. Physical signs of precocious puberty, including abnormal weight gain, growth in the stature, or development of pubic hair, were seen in 2 patients. Preoperative serum β-HCG levels were measured in 6 patients, and all were markedly elevated (range, 5498–85,303 IU/L; mean, 24,623.3 IU/L; normal range of serum, <5.0 IU/L). Surgical removal (5 total resections and 2 subtotal resections) was performed in all patients, and additional chemotherapy (n = 5) or radiation therapy (n = 1) or both were provided, except for 2 patients who were in very poor general condition. After the initial resection, the postoperative follow-up period for the 7 patients ranged from 1 to 41 months (median, 3 months; mean, 15.6 months). Three patients died after a follow-up of only 1–2 months. One of these 3 patients showed multiple small foci of metastatic choriocarcinoma in the lung as determined by CT accompanied by markedly elevated serum and CSF β-HCG levels (serum β-HCG, 8563 IU/L; CSF β-HCG, 4568 IU/L). Four patients are still alive and have been followed from 3 to 41 months (mean, 26 months) after surgery. Three of the 4 surviving patients had serum HCG levels lower than 10.0 IU/L and MR imaging that showed no sign of recurrence or metastasis. 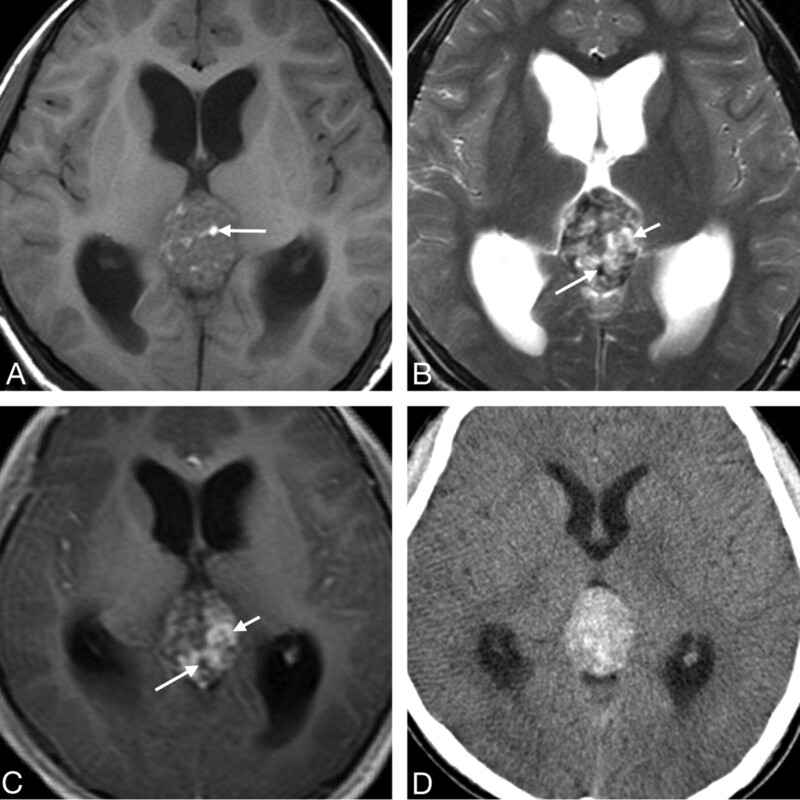 The remaining survivor had 2 small metastatic nodules in the left lateral ventricle on CT.
Six of 7 lesions were located in the pineal region (Figs 1 and 2), and 1 was in the suprasellar region (Fig 3). The tumors compressed the tectal plate anteroinferiorly (n = 6) and/or protruded into the third ventricle (n = 3), leading to mild-to-moderate associated hydrocephalus. The tumors ranged in size from 2.0 to 4.5 cm in greatest diameter, with a mean diameter of 3.1 cm. Six lesions were ovoid (n = 5) or round (n = 1) with relatively well-defined margins, and the remaining lesion presented as an irregular mass with an indistinct margin and involvement of the adjacent dura. Case 3. 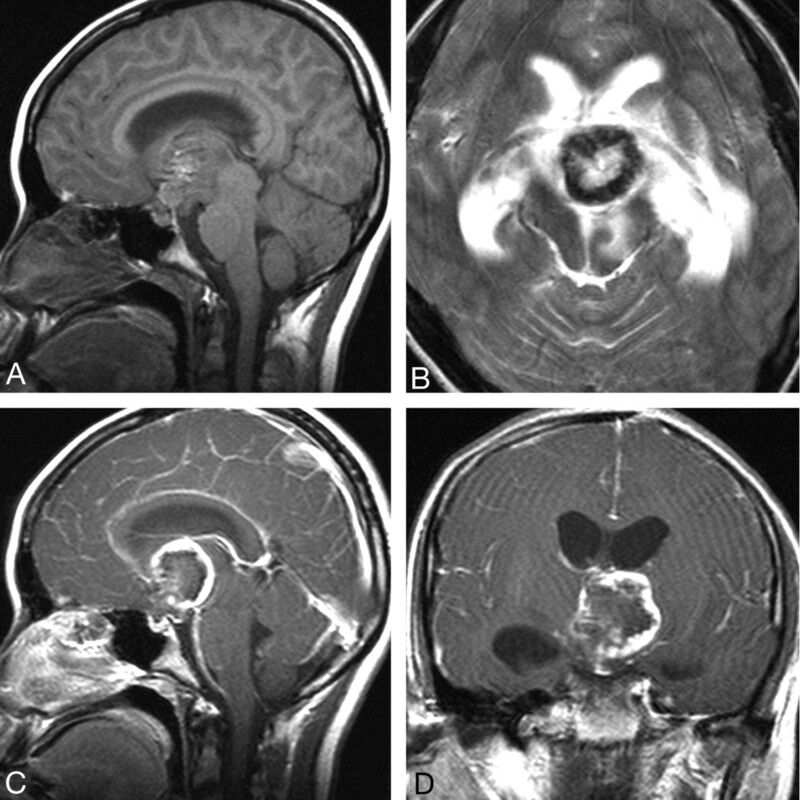 Primary intracranial choriocarcinoma of the pineal region in an 11-year-old boy. A, Axial T1-weighted image demonstrates an isointense mass with some hyperintense areas (arrow). B, Axial T2-weighted image shows the heterogeneity of the lesion with marked hypointense (longer arrow), isointense, and hyperintense (shorter arrow) areas. C, Postcontrast axial T1-weighted image shows marked heterogeneous enhancement of the isointense and hyperintense areas seen on the T2-weighted image (shorter arrow) and no enhancement of the hypointense areas (longer arrow). D, CT image shows a heterogeneous tumor with hyperattenuation. Case 5. Primary intracranial choriocarcinoma of the pineal region in a 14-year-old boy. A, Axial T1-weighted image shows an isointense mass, with hyperintense foci in the center. B, Axial T2-weighted image shows a mass with mixed hyperintense and marked hypointense areas (arrows). C−E, Postcontrast T1-weighted images show the mass with heterogeneous (C−E) and ringlike enhancement (D and E) and marked hypointense areas on the T2-weighted image without enhancement (C, arrows). Case 4. 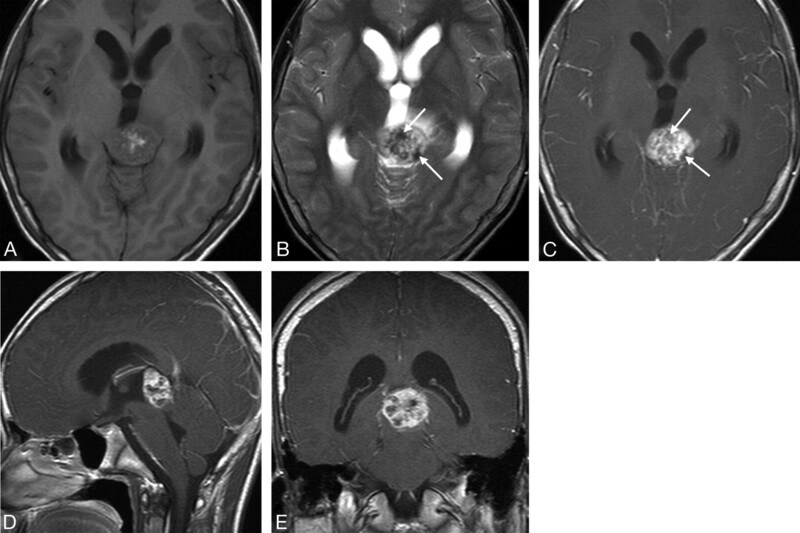 Primary intracranial choriocarcinoma of the suprasellar region in a 14-year-old girl. A, Sagittal T1-weighted image shows an isointense mass, interspersed with foci of hyperintensity. B, T2-weighted image shows a ringlike mass with a solid hypointense rim wall. Sagittal (C) and coronal (D) postcontrast T1-weighted images show ringlike asymmetric thick-rimmed enhancement with mural nodular enhancement. On T1-weighted images, 6 of 7 lesions were isointense with additional small foci of hyperintensity, and the remaining lesion showed mixed hypointense and isointense signal intensity. In contrast, all 7 lesions were markedly heterogeneous (with areas of both hypointense and hyperintense signal intensity) on T2-weighted images, with additional foci of isointensity in 2 patients (Fig 1B). Contrast-enhanced MR images demonstrated areas of mild (n = 1) or marked (n = 6) heterogeneous enhancement (Figs 1⇑−3), ringlike enhancement (n = 4, Figs 2 and 3), and/or intratumoral nodular enhancement (n = 3, Fig 3). On T2-weighted images, enhancement occurred approximately at the isointense or slightly hyperintense areas (n = 5, Figs 1B and 2B) and hypointense areas (n = 2, Fig 3B). Some striplike or patchy areas of hypointensity on T2-weighted images demonstrated no marked contrast enhancement (Figs 1 and 2). Cystic or necrotic areas were seen in all tumors, ranging from several millimeters to several centimeters. Most (n = 6) of the tumors had mild-to-moderate peritumoral edema. On unenhanced CT scans (n = 3; patients 1, 3, and 6), all 3 lesions showed heterogeneous hyperattenuation (Fig 1D). Only 1 lesion contained punctate calcifications. Microscopic examination revealed that the resected tumor cells in all patients were dimorphic and were composed of mononucleated trophoblastic cells with uniform round nuclei and clear cytoplasm admixed with large multinucleated syncytiotrophoblastic cells with abundant amphophilic-to-eosinophilic cytoplasm. These 2 cell components were intimately admixed and were often associated with areas of hemorrhage, necrosis, fibrosis, and neovascularization. No other germ cell components were present. Various sites of PICCC have been reported, including the pineal region3,5,17–21 and the suprasellar or parasellar region.5,15,22,23 Less common sites include the lateral ventricle,2 pituitary fossa,24 basal ganglia,2,25 and septum pellucidum.6 In our study, all tumors were located in the pineal (6/7) and suprasellar (1/7) regions. Although several studies have reported CSF dissemination of PICCC at the time of diagnosis,2 most of the PICCCs in our series were single lesions and only 1 case was multifocal. This discrepancy is likely due to the location of the lesions in our series, because most (6/7) of our patients' lesions were located in the pineal region, leading to hydrocephalus, despite the small size of the mass; therefore, they presented at an earlier stage. Correct pretreatment diagnosis is important for determining a therapeutic plan. HCG/β-HCG is a useful biologic tumor marker characteristic of choriocarcinoma. Markedly elevated serum HCG/β-HCG levels are strongly suggestive of choriocarcinoma or mixed GCTs with choriocarcinoma elements. In the series described by Matsutani et al,9 all patients with choriocarcinoma or mixed GCTs with choriocarcinoma elements had highly elevated levels of serum HCG of >2000 IU/L, whereas the serum HCG levels in patients with GCT without choriocarcinoma elements were <770 IU/L. In this study, serum β-HCG levels were assayed in 6 cases, and all demonstrated serum β-HCG levels >5000 IU/L (range, 5498–85,303 IU/L; mean, 24,623.3 IU/L). It appears, therefore, that a patient with a markedly elevated serum β-HCG level of >5000 very likely has choriocarcinoma. Imaging features aid the pretreatment diagnosis when PICCC is suspected. However, most cases of PICCC reported in the literature are case reports with rather nonspecific radiologic findings. According to previous reports, PICCC is frequently seen as a solitary mass with heterogeneously increased attenuation on noncontrast CT scans.5,18 Our CT findings in 3 patients with PICCC were similar to these previous case report findings. Although the presence of calcification has been described in several cases,18 it is usually not a dominant feature of PICCC. In our study, only 1 lesion contained punctate calcification in the 3 patients who underwent CT evaluation. MR imaging has provided improved localization, preoperative evaluation, and characterization of the tumor. In the few published reports,2,3,6,20,23,26 the tumor has been described as an ovoid or irregular mass with a large hemorrhagic component on MR imaging. The presence of hemorrhage is a characteristic feature of PICCC. After the administration of contrast, the tumors usually show markedly heterogeneous enhancement. Our results confirm these findings. In our series, the internal architecture was best displayed on T2-weighted images, in which all lesions displayed heterogeneous hypointensity and hyperintensity. Correlating the MR imaging appearance and the microscopic findings, the heterogeneous signal intensity seen on MR images reflects the various components contained within the lesion, such as intratumoral hemorrhage, fibrosis, cysts, necrosis, or vascular proliferation. Frequent hemorrhage is seen in PICCC due to the fragility of vessels perfusing these trophoblastic tumors and due to the innate capacity of trophoblastic cells to invade and erode vessel walls. Marked striplike or patchy areas of hypointense signal intensity on T2-weighted images corresponded histologically to intratumoral blood products such as hemosiderin and fibrosis; this correspondence was a feature seen in all our patients. On T1-weighted images, these foci of high signal intensity were assumed to correlate with small foci of hemorrhage. On gadolinium-enhanced T1-weighted images, the heterogeneous, ringlike, and intratumoral nodular enhancement was an additional feature seen in our study. To our knowledge, this varying enhancement pattern has not been described previously. Heterogeneous and intratumoral nodular enhancement is most likely due to the sheet- or cordlike arrangement of the trophoblastic cells, which undergo vascular proliferation. The ringlike enhancement may be attributed to plentiful blood vessels on the peripheral rim of the tumor. Consequently, cystic necrosis is more likely to occur in the central area of the tumor. In most of the tumors (5/7), enhancement on T1-weighted images was seen in the isointense or slightly hyperintense areas on T2-weighted images. Before one suggests the diagnosis of a PICCC, it is important to exclude a hemorrhagic metastasis from the genital system because extracranial choriocarcinoma, especially arising from the gonad, is known to spread via a vascular route. It also often metastasizes to the central nervous system in 3%∼28% of patients.27 The differential diagnosis of a primary intracranial lesion in the pineal or suprasellar region includes other GCTs (germinoma, teratoma, embryonal carcinoma, and endodermal sinus tumor), meningioma, astrocytoma, aneurysm, or venous malformation. The patients' age and biochemical markers, such as serum HCG/β-HCG, carcinoembryonic antigen, and α-fetoprotein, can be useful in differentiating the lesions from a PICCC. From the standpoint of the MR imaging findings, intratumoral hemorrhage of other GCTs is rare, except for mixed GCTs with a choriocarcinoma element. Although some germinomas may have cystic components,26 they demonstrate relatively homogeneous enhancement. Teratomas often show fatty and calcified components.4,20 Embryonal carcinoma and endodermal sinus tumor tend be larger than PICCCs and irregular in shape.4 In addition, the signal intensity of PICCCs on T1- and T2-weighted images tends to mimic meningiomas, though most PICCCs show heterogeneous enhancement, whereas meningiomas most often have homogeneous enhancement and thickening of the adjacent dura. Astrocytomas tend to show hyperintensity on T2-weighted images,20 while PICCCs demonstrate heterogeneous signal intensity with marked hypointense areas. A partially thrombosed aneurysm or venous malformation with blood products demonstrates intrinsic T2 hypointensity and can be excluded on the basis of MR imaging or CT angiographic findings. The treatment of PICCC remains controversial because the tumor is highly resistant to standard treatment. Although several studies2–4 have reported cases of successfully treated PICCCs by using a combination of surgery, chemotherapy, and radiation therapy, the disease is usually fatal and there is no established treatment. Some investigators4,8,9 recommend surgery as the first-line therapy when the tumor is small enough to resect completely. Our series of 7 patients with PICCC of the pineal and suprasellar regions revealed that PICCC has characteristic MR imaging features, such as heterogeneous signal intensity with marked hypointense areas on T2-weighted images. Contrast-enhanced T1-weighted images demonstrated heterogeneous, ringlike, or intratumoral nodular enhancement. If a young patient presents with a pineal or suprasellar tumor and imaging features similar to those described above, serum HCG/β-HCG levels should be sought and biopsy of these highly vascular tumors avoided. Accepted after revision May 2, 2010.